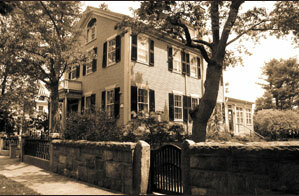 Bed & Breakfast, Fairhaven, MA | Massachusetts historical Bed & Breakfast | Country Inn. The Delano Homestead Bed and Breakfast, built in 1832 by one of New England's most prominent families, is a stunning example of transitional/ late Federal / Greek Revival architecture. Located in historic Fairhaven, Massachusetts, the Bed and Breakfast is situated on a quiet, residential street in the heart of the village center, close to the town hall, library, beach, parks, bicycle path, museums, maritime academy, shops, restaurants, and working waterfront. The 10-room, 3,800 square foot Bed and Breakfast, complete with conservatory and green house, framed by stone walls and wrought iron gates, was once the residence of Franklin Delano Roosevelt's mother, grandfather, and great-grandfather. It was FDR's summer and holiday residence into his adult years and was visited by him and Eleanor, even as president and first lady.